Well, we got a couple of lovely warm days this week. That was nice. I am still dreaming of summer though. I took this image this past summer of a lovely Viceroy butterfly that was sitting on a leaf along the road by my house one afternoon. 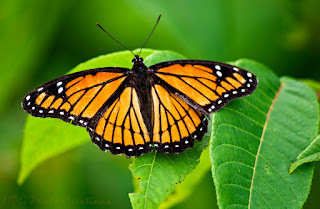 Viceroys differ from Monarchs in a way that's easy to tell because of the line that runs across their lower wings. Monarchs do not have this at all. They both are lovely butterflies.